We in Canada are used to seeing poppies on lapels this time of year. It’s a immediate signal that Remembrance Day is near, and that the time of commemorative activities has begun. On this Remembrance Day, I would like to take a moment to write about why the poppy gain significance in the 20th century, and how it has become a symbol of commemoration throughout North American and the Commonwealth. In the years following the Great War, individual people and states tried to make sense of the conflict that had just finished. For many, the period just after the war became one of silence, as returning soldiers simply tried to get back to their lives after 5 years of dangerous disruption. Times were tight as well, as countries struggled to reconcile with the enormous debts incurred as part of the war effort. Germany in particular descended into near anarchy, with ex-soldiers fighting as militia groups in the streets. Bolshevism also posed a threat, though it was perhaps more overstated than real, and groups all over Europe, Britain and even in Canada rallied to change their society in the name of communism. Politicians in particular struggled to find ways to build unity in their now fractured population. Men who had given their health, their youth and their limbs returned to find that they had no jobs, and the families of those who did not return struggled to make ends meet using paltry death benefits. By 1920, ceremonies on Armistice Day were commonplace. Canada would build the Vimy Memorial in 1936 and the National Memorial in 1939, and towns throughout the country unveiled their own smaller cenotaphs and memorials throughout the 1930s. One of the most enduring symbols of the First World War, however, is the poppy. The campaign to wear poppies to mark Armistice Day began in the United States in 1920, when the National Veteran’s Association adopted the wearing of a silk poppy. England and her dominions followed suit the year afterwards, and now the poppy has come to symbolize not only those lost in the Great War, but in the wars since. But why the poppy? For many not on the front, the poppy was synonymous with Flanders after John McCrae published his immensely popular poem “In Flanders fields”. The imagery of the beauty and fragility of life juxtaposed against the terrible landscape was a combination that stirred the sentiments, but in an appropriate way. McCrae’s poppies were not Sassoon’s slimy yellow trenches or Owens’ gasping dying men; they were beautiful and noble, and a reminder of the peace that would someday again return. The unfarmed battlefields of Flanders could grow only poppies, and soon both during and after the war the landscape was covered in the red flowers. 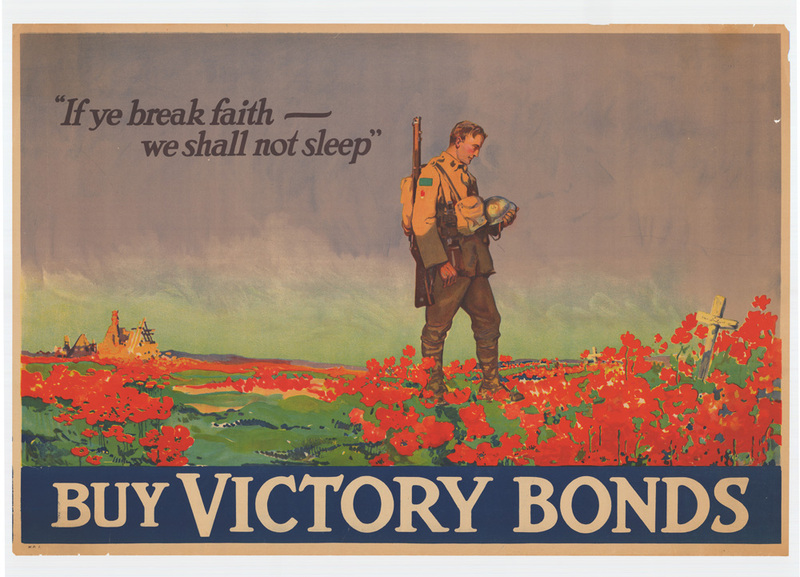 Poppies became a powerful symbol of the Empire war effort, and could be seen in magazines and on posters advertising war bonds and calling for recruits. Thus, the poppy was already a familiar symbol within the English-speaking world at the time. By wearing it, everyone could easily show their support for those who were left and their commitment to the peace that followed the war.